Proxifier settings located in the Profile menu together are referred to as a profile. This includes Proxy Servers, Proxification Rules, Name Resolution and others. Settings available under Log and View menus are not included in a profile. Mostly they represent settings related to the Proxifier user interface and appearance. Proxifier automatically saves the current profile (without prompting) on any change. You can save the profile with a specific name by File->Save Profile As... and load it later with File->Load Profile. The name of the active profile is displayed at the title of the main window. To import or export a profile from/to a file use the Import Profile or Export Profile commands of the File menu respectively. 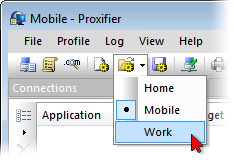 With Import Profile you can import settings from the old versions of Proxifier (prx-files). You can also manage profiles at the file level with File->Manage Profiles... command. Proxifier profiles are user specific. Each user account on the computer has its own private set of profiles. “C:\Users\All Users\Application Data\Proxifier\” or its equivalent on your system. Proxifier checks this path on start and if there is “Default.ppx” file, it loads it automatically. Proxifier v3 uses XML for profile files. The format is human readable and self-explanatory. You can edit the content with any third party tools and scripts. If Proxifier is not running it will be started with specified profile. If Proxifier is already running, the profile will be loaded into the running instance. The same settings are requested anytime you use Export Profile. The description of each option is provided in the dialog window above. Basic and Current user account uses AES 256 bits. 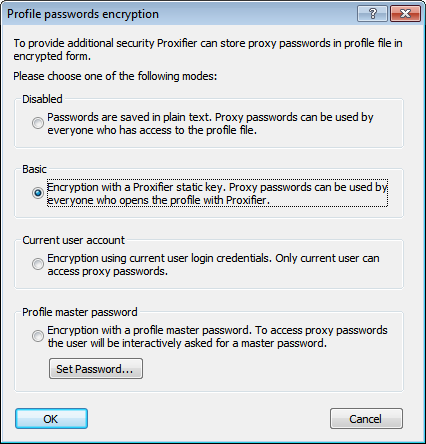 For Profile master password Proxifier uses the standard Windows Data Protection API (DPAPI). Internally it is based on Triple-DES. When Profile master password is used Proxifier asks it each time the profile is loaded (including at startup). 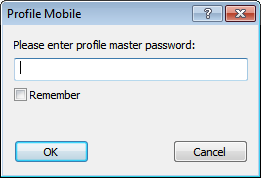 You can save this password within the current user account with the Remember checkbox. Proxifier will not load the profile until the correct password is specified. Please consider this if you are going to use Proxifier in unattended mode (e.g. with autostart feature). If you enter an incorrect password, Proxifier will ask you to repeat or load the profile with blank passwords.